10–14 hp Two/four hub-mounted electric motors, driven by battery and/or petrol engine. 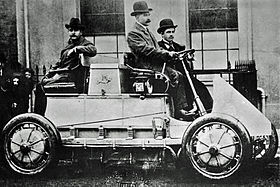 The Lohner-Porsche Mixed Hybrid (sometimes wrongly referred to as Löhner-Porsche) was the first hybrid vehicle and was developed by Ferdinand Porsche. First prototypes were two-wheel drive, battery-powered electric vehicles with two front-wheel hub-mounted motors. A later version was a series hybrid using hub-mounted electric motors in each wheel, powered by batteries and a gasoline-engine generator. At the age of 23, Ferdinand Porsche boarded a train in North Bohemia, Austria-Hungary (now Czech Republic), and headed for Vienna to embark on his first job. Despite Porsche having no formal engineering education, Jacob Lohner, at his Lohner-Werke, employed him to develop an electric powertrain for his coaches. Porsche's prototype car boasted a low-friction drivetrain, due to the hub-mounted electric motors directly driving the wheels. Each internal-pole electric motor was capable of 2.5 to 3.5 hp (1.9 to 2.6 kW), peaking to 7 hp (5.2 kW) for short bursts. The 1898 "System Lohner-Porsche" created a press whirlwind across Europe. Lohner received his first order from E.W. Hart, himself a coachbuilder of Luton, Britain. Hart asked for significant modifications. His vehicle was to be capable of running on petrol, as well as electricity, of carrying four passengers, and of employing four-wheel drive. The custom coach was a monster dubbed La Toujours Contente ('always satisfied' in French), a jab at record-holder Camille Jenatzy's electric La Jamais Contente, and was exhibited at the December 1900 Paris Exhibition. The enormous Lohner required 1.8 tonnes of batteries consisting of a 44-cell 80-volt lead-acid battery, all housed in a spring-suspended battery container to protect the fragile cells. The four electric motors weighed a total of 1280 pounds, contributing to a total vehicle weight of over 4 tonnes on its Continental pneumatic tires. With a battery capacity around 270 amp-hours and four forward speeds, the 56-horsepower coach ran in several expositions and competitions. It cost 15,000 Austrian crowns. Despite such ambitious engineering, the car was completed on time and was delivered personally by Porsche. Hart was so impressed, he purchased another, two-wheel drive example at a relative bargain of 7950 Austrian crowns. On November 6–9, 1900, the Automobile Club of Great Britain and Ireland sponsored an electric vehicle endurance trial, in which the four-wheel drive Lohner-Porsche was one of 11 entrants—one of three entrants Hart brought to the Chislehurst starting line. The first-place winner of the trial was a Louis-Krieger car dubbed the 'Powerful'. Thanks largely to its lighter weight and larger-diameter wheels, it achieved a first run of 59 miles at an average of about 10 miles per hour. Le Toujours Contente suffered tire failures on its 34 miles with Porsche at the wheel. One competitor stated, "there were inches of mud on the floors; rain came through the roof; the sheds were doorless and the cars and attendants were nightly exposed to the full force of wind and rain." Other electric vehicle entrants managed only 7 miles distance through the muddy, rutted course. Ferdinand Porsche caught a severe cold, contributing to the vehicle's elimination from further competition. Too costly for popular consumption, Lohner utilised the revolutionary drivetrain technology for larger commercial vehicles. Lohner-Werke manufactured rear-drive double-decker buses for Berlin and front-drive fire engines for the cities of Vienna, Frankfurt, and London. Lohner was commissioned to build vehicles for the Austrian emperor, as well as the kings of Norway, Romania, and Sweden. According to a biography by Andreas Stieniczka, the funeral coach for Archduke Franz Ferdinand, whose murder in Sarajevo was the event which sparked off World War I, was manufactured by Lohner-Werke. Over 300 Lohner-Porsche vehicles were sold through 1906. In addition to custom coachworks, Lohner supported Porsche's continued racing efforts. Several Austrian land speed records were set, with a top speed eventually achieving 37 mph (60 km/h) with Porsche at the wheel. It was victorious in a number of motorsport events including the Exelberg-Rally in 1901. With both drivetrain engineering excellence in Lohner's custom coaches and motorsport experience, Porsche won the 1905 Potting Prize as Austria's most outstanding automotive engineer. In 1906, Porsche was snapped up by Daimler-Benz as chief designer. Jacob Lohner said at the time: "He is very young, but is a man with a big career before him. You will hear of him again." The Lohner-Porsche's design was studied by Boeing and NASA to create the Apollo program's Lunar Roving Vehicle. Many of its design principles were mirrored in the Rover's design. The series hybrid concept underpins many modern railway locomotives, and interest in series hybrid automobiles is growing rapidly. ^ "History of Hybrid Vehicles". HybridCars.com. 2006-03-27. Archived from the original on 2009-09-04. Retrieved 2011-10-25. See year 1898. ^ "Lohner-Porsche Mixte Voiturette". Ultimate Car Page. 2007-11-19. Retrieved 2011-10-25. ^ Noel McKeegan (2007-11-07). "Back to the future: electric-drive Lohner-Porsche at the L.A. Auto Show". Gizmag. Retrieved 2013-09-29. Porsche-Museum, Stuttgart: Ferdinand Porsche - Pionier des Hybridautomobils/Hybrid Automobile Pioneer , German/English, Edition-Porsche-Museum, Stuttgart 2010, ISBN 978-3-9812816-4-4. Wikimedia Commons has media related to Lohner Porsche. This page was last edited on 31 January 2019, at 01:13 (UTC).